Alabama’s forest production and processing industry contributes nearly $21 billion to the state’s economy and positions it to be a leader in the development of a sustainable bio-based economy that includes wood processing, construction, chemicals and energy, bioplastics, and packaging. With several other wood related industries on the horizon, its impact on the state’s economy is expected to be significant. In addition to the positive economic indicators evidenced by the increases in wood pellet consumption, demand for biodegradable wood-based packaging, and growth to harvest ratio of 1.5 in our state; the use of cross-laminated timber (CLT), a newly engineered wood product system, in mid- and high-rise residential and non-residential construction is also growing. CLT features a unique layered engineering which gives it steel-like strength, and it’s light, easy to assemble, sustainable, fire resistant and cost effective; making it ideal for commercial construction. CLT offers the structural simplicity needed for cost-effective buildings, as well as benefits such as fast installation, reduced waste, improved thermal performance, and design versatility. Because of its high strength and dimensional stability, it can be used as an alternative to concrete, masonry and steel in many building types. Due to its performance compared to conventional materials, it is also gaining in popularity among residential builders according to International Beams, a Sarasota, Florida-based producer of engineered wood products. With CLT’s growing popularity and diverse uses, as well as the strength of the wood products industry in Alabama, International Beams recently announced that it will invest nearly $20 million to open the first commercial CLT manufacturing plant near Dothan to produce innovative timber panels and beams using Southern Pine lumber. 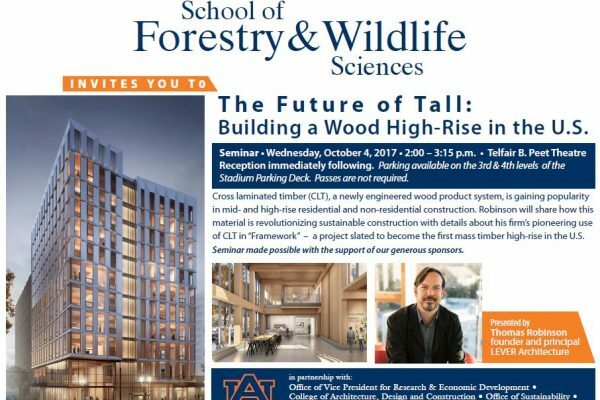 To raise awareness of the significance of CLT to Alabama and beyond, Auburn University will facilitate a roundtable discussion among stakeholders and a public seminar, the Future of Tall: Building a Wood High-Rise in the U.S., on Oct. 4 at Auburn’s Telfair B. Peet Theatre. The seminar will feature Thomas Robinson, accomplished architect and founder of the Portland, Oregon-based international architectural firm, LEVER Architecture. Robinson’s firm is pioneering the use of CLT in the United States with “Framework” – a project slated to become the first mass timber high-rise in the U.S.
As we are witnessing in commercial construction, environmental concerns and evolving technologies are moving companies toward the use of sustainable forest biomaterial for everything from packaging, cosmetics, and automobiles to appliances and pharmaceuticals. These developments are increasing the demand for professionals with diverse expertise in biomass production and operational logistics; conversion processes of products and packaging; and product development, sustainability and business. To meet this need, the School of Forestry and Wildlife Sciences in collaboration with the colleges of Agriculture, Engineering, Business and Architecture, Design, and Construction has developed a new undergraduate degree program in Sustainable Biomaterials and Packaging. One of the only programs of its kind in the Southeast, this interdisciplinary program will provide students with knowledge, expertise, and hands-on experience to prepare them for lucrative careers in the emerging bio-based industry that seeks more sustainable and economical alternatives to a petroleum based market. Pending approval by the Alabama Commission on Higher Education, it is anticipated the new degree will begin enrollment in the fall 2018. 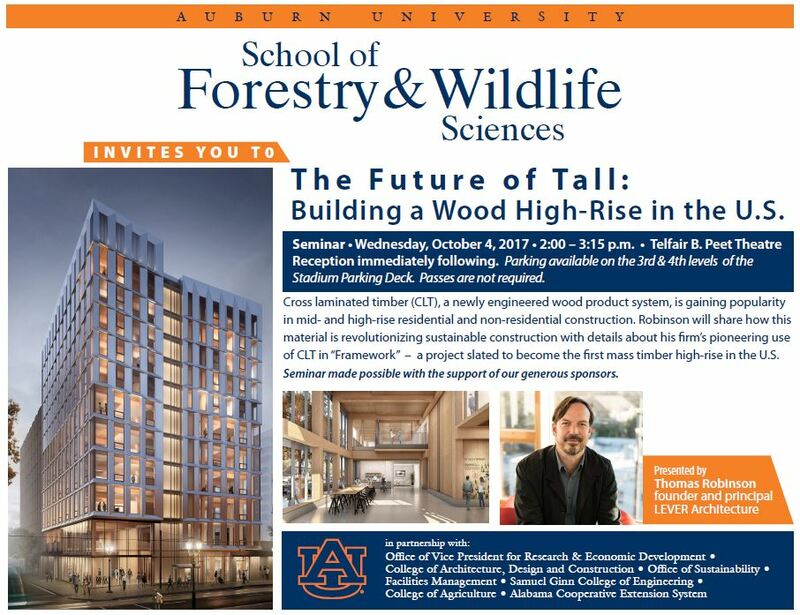 To learn more about the Future of Tall: Building a Wood High-Rise in the U.S. public seminar and reception on Oct. 4, visit http://sfws.auburn.edu/event/future-of-tall-building-a-wood-high-rise/.